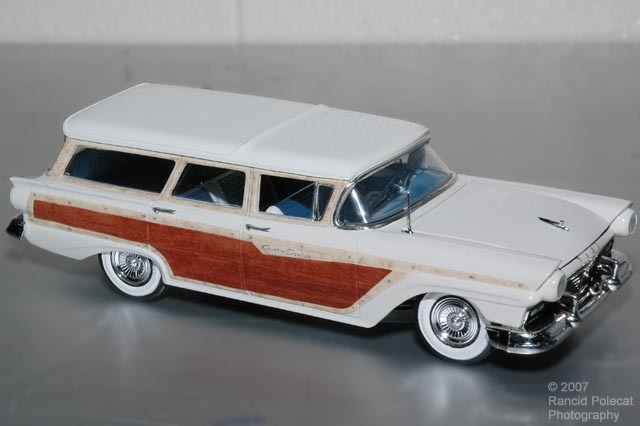 When Harry saw that the Modelhaus offered a resin transkit to build a 1957 Ford Country Squire station wagon, he knew he had to build one. Harry ultimately used three kits to build this model: the Modelhaus resin transkit, the requisite Revell 1957 Ranchero (unchopped) donor kit, and an AMT 1957 Ford Fairlane kit. Modelhaus provided roof, sides, interior sides, second an third seats, and the cross bar between the headlights. The windshiled, front and rear chrome, chassis, and lower engine are from the Revell kit. The headlights, hood ornament, wheel covers, wheels, and tires are from the AMT kit.